1. 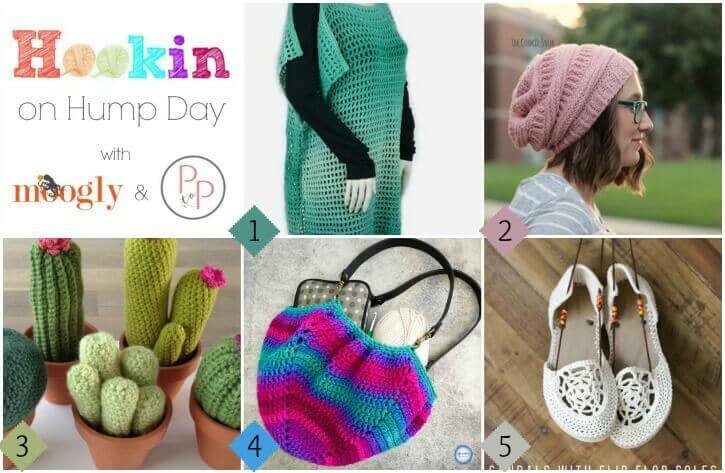 MOST CLICKED LINK: Coraline’s Endless Summer from Simply Collectible – This pattern can be customized for the look and fit you desire … perfect as a tunic or Summer cover-up … FREE crochet pattern! 2. 3 mL Slouchy Beanie from The Cookie Snob – Be all set for Fall with this stylish slouchy hat … FREE crochet pattern! 3. Hook cacti from Sophietjes – Hook up these adorable and no-maintenance plants! The pattern is written in Dutch but with a comfortable knowledge of increasing and decreasing and the click of the translate button in your web browser you can definitely stitch them up. FREE crochet pattern! 4. Twilight Stripes Fat Bottom Bag from Left in Knots – A colorful and versatile bag … great as a purse or project bag … FREE crochet pattern! 5. Dream Catcher Crochet Sandals with Flip Flop Soles from Make & Do Crew – These sandals are super cute and the flip flop soles make them ideal for indoor and outdoor use … Part 1 of the FREE crochet pattern!